This is the second book in the Sewing a Friendship series. The first book was written by Ms. Tinti when she was ten years old. In this new book, we again meet our young friends: Sokron Blossom, Nina Key, Jonsy Jipsey, Meeka Venya and Kiki Shaver. Grandma Babushka oversees matters; Dogon the dog is the faithful messenger secret agent, and The-Wind narrates as himself. The Wind begins the story when he notices that Dogon is scurrying to Meeka’s house with a message tied around his neck. The letter reveals that Nina has a horrible scratch on her finger and cannot play her music. Meeka, the math nerd , tries to think up a way to make her feel better. Dogon dashes to Jonsy who finds a Happy Song as a present. Dogon finds Kiki next. She is trying on her outfit from her last fashion show. Before meeting these girls, she did not care much about others. She ponders how she can help Nina. Finally, Dogon arrives at Sokron’s home where she is cutting out pictures of dresses from a fashion magazine. She rummages though her closet to find a gift. Dogon reports back to Grandma Babushka who has been hiding in a tree surveying the situation from afar. The girls arrive at Nina’s home to surprise her. Nina has been in her room and has just found Bellkoo’s album of songs about friendship and never giving up. That reminds Nina of her own friends. At that moment, the doorbell rings. The four girls have never been in Nina’s house and are shocked to see how strict and tidy it appears. Notes everywhere say, “Don’t touch this!” They are relieved to find that Nina’s room is a mess. Each one of them has a special present for Nina., which represents each of their personalities. The Wind watches as the second part of the book unfolds. Nina suggests that they tell stories and draw pictures on fabric to represent them. She begins by narrating a tale of friendship like their own. As each girl creatively adds to the imaginary story, they incorporate their personality and elements of their friendship. The stories are cleverly written and interwoven. Tinti provides an appendix with a find the differences picture and then invites the readers to submit their own stories to her, which she will incorporate in a new book written for children by children. The illustrations are done in manga style in vivid colors. These characters remind me of Precious Moments figures. Middle grade readers will find them delightful. They share similar issues, likes and dislikes with their readers. A delightful story and a worthwhile addition to a parent or classroom library. Adults will enjoy the creativity displayed in this book. Looking forward to seeing more from this young author and reading that collection of stories from children around the world. If you enjoyed reading this review, please subscribe and follow my biweekly posts. Journey of Dreams is a work of historical fiction which takes place in 1984-85. During that time the Guatemalan government destroyed 440 villages using a slash and burn campaign. More than one million families were displaced and 200,000 people fled Guatemala. Human rights volunteers and religious leaders found safe havens for some of the exiled. It became known as the Sanctuary Movement. These volunteers funneled them to safety and helped them to gain political asylum. In this book Tomasa is a thirteen year old Mayan girl born in the highlands. She embodies the experiences of many of these refugees. Her story reflects the courage of many like herself and reveals the rich tapestry of her culture. At the beginning of the story Tomasa and her family live in a small village. They farm on their land; the women sell native clothing and crafts at the local market. But lately, the rebel soldiers have been forcing young boys to join the army. They mercilessly wipe out the opposition. One day Tomasa’s mother tells her son Carlos that government planes are spraying harmful chemicals. They are overheard and must flee the village to survive. Conditions continue to deteriorate. Many local villagers have been placed in model villages, which are nothing more than concentration camps. Papa is determined to escape with the family. Soldiers suspect them; they are forced to return. Soon after soldiers come to burn their village. Their grandmother dies trying to escape. They hide and make their way slowly on foot to the capital city. From there they will try to cross into Mexico. Every night as they cower in the fields, Papa tells them a native story, while every night Tomasa has haunting nightmares. Papa must find work while Tomasa, her brother Manuel and baby sister, Maria hide. They are afraid of everyone. It takes three tries to cross the border to Mexico.They almost lose their lives on the river and are endangered by the soldiers shooting at them and the “coyotes” who take their money to protect them. Finally, as they arrive in Mexico, their friends in the Sanctuary Movement attempt to protect them. Manuel despairs of ever finding his mother and adopts Juana, another refugee as his protector. Their goal is to reach Phoenix, Arizona in the United States and to locate their mother and brother, Every move is fraught with danger. They fear moving around in the daytime. Will they ever find a measure of safety and become a family again? This book is carefully researched and well written. I finished the book in less than two hours. Age recommendation is eleven and up. The book provides a glimpse into the horror of warfare and human enslavement. 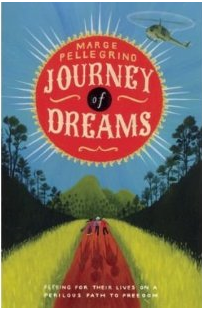 The interweaving of native culture in dreams and storytelling is vivid and engaging, The author provides a glossary of Spanish and native terms as well as a map to mark the journey. Teachers will find much to discuss with their students and adults will learn more about a tragedy that resulted in making a native people stronger and more resilient. If you enjoyed reading this post, please consider subscribing and following my biweekly reviews. Just hit the word Follow or subscribe with the orange RSS button. A BIG WELCOME AND THANK YOU TO ALL MY NEW FOLLOWERS! This is a story about a girl named Lucy-Go-Lucky. It is written in rhyme and composed of much beautiful poetry. Lucy has a vivid imagination. She has trouble sleeping, but when she dreams, her dreams are so real! One night she decides that she wants to dream of birds singing, of sun and of snow. She finds the Planet Ping where there are birds with purple eyes and beaks who sing while they are upside down. She dances and parties all night and does not want to leave. They give her a baby Pingle; but when she wakes up, it is gone. Feeling depressed, the following night Lucy decides to be a queen in a land of dragons and castles. She meets the Pongles who have buttons for eyes and teeth and rubber tires for skin. But they don’t want her to rule them in the land of Pong, and she must fight the Pongles all night long. She traps them in her sack, but when she awakes in the morning, they are gone. She is grumpy and does not pay attention in school. That night she resolves not to sleep. When she does succumb, she is dreaming of riding on a horse through the forest. There she meets the Shadow Grudge who lives in the Planet of Lost Hope. He presents her with a huge stinky cake to eat. After eating it all night long, she begins to look like the ugly Grudge who has peppercorn eyes and feet made of moldy bread. In the morning the Grudge is standing beside her bed. Lucy draws a picture of the Grudge and tries to flatten him in a book. Her father wakes her and tells her it is time to go to school. She does not want to get out of bed. He reassures her that night dreams are not important, we can make our dreams reality by working hard and using our brains. So Lucy decides to face her fears. The author informs us that she has been influenced by Dr. Seuss, Edward Lear, Jim Henson, and the Sendaks. 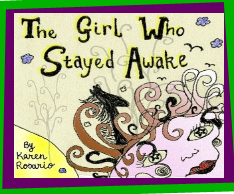 You can certainly see this influence in the poetry she writes, The mostly black and white illustrations and rambling script stand in stark contrast to the explicit vivid images in her dreams. The book needs strong parental or teacher guided discussion, but it will serve as a starting point for lots of interesting conversations and comparisons for older children. I recommend adding it to your poetry collection. This is a nonfiction book which taught me some interesting facts about animals. A giraffe has the highest blood pressure of any animal, turtles have been on earth for more than two million years, and you can tell the mood of a zebra by looking at its ears! Owens points out that scientists are continuing to research and investigate. They will undoubtedly discover new species on land, in air and under the sea. The author discusses their patterns of behavior, what they eat, the climates they live in, and how they survive. Many of them are as afraid of us as we are of them. There are many animals that are endangered because humans have taken over their native habitats. The author urges the young reader to learn about conservation and how to protect them from extinction. All of us must share the planet earth together! 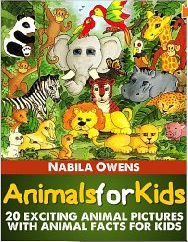 This book features twenty animals. Some of them like dogs, cats and turtles have been largely domesticated and may be our pets. Others like elephants, cheetahs, lions and zebras might be visited in a zoo. An aquarium visit could allow us to visit dolphins, whales and sharks. There are animals who may be seen all over the world like the many species of birds and spiders, and others like the kangaroo which are only found in Australia and New Guinea. Animals like some spiders and snakes have the ability to harm humans with one bite! Animals may make wonderful pets, or interesting creatures to visit in a man-made controlled habitat, but they can be dangerous. Each of them have unique qualities to their species. Always ask an adult before approaching an animal you do not know. What a present for Earth Day! These spectacular images celebrate our planet and allow us to view it from afar. One can see the patterns, shapes and colors as they appear from outside our planet. The images display our oceans, atmosphere, deserts, cities, mountains, volcanoes, islands, forests, rivers, lakes, craters, trenches, glaciers and the list goes on and on. There are 75 large and beautifully colored images with accompanying text giving background on history, climate, ecosystems and topography. Some of the images are from familiar landmarks like the Mississippi River and others are more obscure like Lake Disappointment. An appendix indicates when, where and from which satellite the image originates. While adults may marvel at their beauty, a child can use these images as a steppingstone to further exploration of a particular interest. Teachers may want to catalog them for use in many areas of the curriculum. If nothing else, they are a celebration of the planet we live on and a reminder for us to preserve that beauty. Suddenly, one day at school everything changes. Jack is hurt in the playground. Something has mysteriously landed in his eye. No one knows what happened or where the glass splinter came from. Jack disappears and Hazel searches for him. Jack is cold and mean to everyone, Hazel cannot understand why she is being shunned. Then she sees Jack walking into the forest and decides to follow him. Here is where the fantasy adventure begins in Part Two. The reader is informed that a demon with a forty seven syllable name decided to fling an enchanted mirror into the sky which shattered into a million pieces. Strange things began to occur on earth. Personalities change, people stop working or suddenly isolate themselves. Jack developed a cold heart. Hazel knew something horrible had happened to Jack. She was determined to save him and so she walked alone into the woods at night with a backpack and a heavy heart. Hazel saw the white witch at the edge of the forest, She knew that Jack had been lured into the woods and would never return if she could not break the spell. Now the adventure begins. Hazel faces her fears and death as she travels into the forest. She meets wolves, demons and strange creatures. 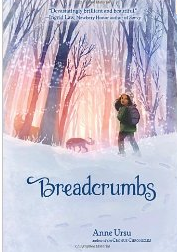 Breadcrumbs has often been described as a retelling of the Snow Queen. There are elements of many other fairly tales as well like The Nightingale and The Red Shoes. This book is written well and has beautiful language. There are many metaphors, analogies and personifications. It has been suggested for ages eight and up, but I feel much of the dark fantasy is more appropriate for children twelve and older. The struggle of the characters to find themselves and face their fears adds a level of realism to the story. Adults will find the tale intriguing and may enjoy reminiscing about their childhood struggles. Certainly, the book lends itself to lots of discussion and comparisons on the multifaceted plot and characters. Hope Irvin Marston has written more then thirty books for children. Sackets Harbor: Powder Monkey will not disappoint. This book has value on several levels. It is based on real historical events carefully researched and developed. The book reveals a glimpse into the life of families who lived there. Last, but certainly not least, the story is an adventure tale that tweens, teens and adults will not be able to put down. 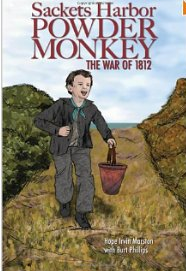 The story begins with a ten year old boy named Rankin sneaking out of bed to catch a glimpse of the warship sent to guard Lake Ontario from imminent attack by the British. The embargo forbids the local farmers from trading with the Canadians preventing the Americans from smuggling potash in for sale. Rankin, his brother Will, and his Pa risk arrest every time they cross the river. Rankin is enthralled by the warship and is determined to find a way to enlist in the fight. Will convinces his parents to allow them to try. Captain Woolsey is impressed with the boys’ enthusiasm and astounded that they can write. Rankin will become a powder monkey, which means he will be transporting the gun powder to the cannons. Will, who had been an apprentice with a gunsmith, will be an armourer working with weapons aboard the ship. Marston does an excellent job of portraying the emotions of these two boys. The glamor soon wears off as Rankin must swab the bilge and Will spends hours cleaning rust off the old cannons. Much to their dismay, their ship is dispatched to catch smugglers; friends and family trying to sell potash just as they had done. Rankin is becoming despondent. Finally, one year later in 1812, war is officially declared. Their ship, the Oneida, is no match for the British fleet. How will they and the hard working families of Sackets Harbor face the overwhelming odds? Can they succeed in defeating the British? The author provides lots of resources to help the reader fully comprehend the historical events. There is a map of the area, a list of the historical characters, a glossary of time period and naval terms, an annotated bibliography including internet resources, how to visit the battlefield, and even the local folklore associated with it. Teachers and homeschooling parents will be able to take this story and use it as a springboard for discussion and activities in many other areas of the curriculum.This book is so well written that most children and adults will want to read it in one sitting. Even though there are no illustrations within the story itself, the text is large and double spaced making it easy to read and follow for those with vision or learning disabilities. The main characters are male, but I do not see it as a “boy’s ” book. Authentic period language words like “Huzzah” and “Thankee” make it easy to imagine yourself being there. The spirit of camaraderie in battle displayed by the settlers will make you want to stand up and cheer them on to succeed. This book is targeted for a middle grade audience, but adults will find it equally enjoyable and informative. If you choose to read this book, you won’t be disappointed!